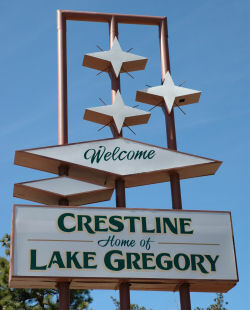 Come to Crestline and Lake Gregory and enjoy shopping at our unique stores in the cool mountain air, and find bargains that you may not find in the more expensive stores up the road in Lake Arrowhead. In Historic Old Town Crestline (shown above) you will find women's apparel, gifts and fine furnishings. There is also a one-of-a-kind family restaurant called the Loose Caboose, that features live model trains that run along the rafters. Along Lake Drive and adjacent streets you will find apparel and gift shops, florists, coffee bars, a hardware store, a photo studio, restaurants, nurseries and markets. At the lake's swimming beach there there is a beach shop that is open during the summer along with a snack bar and boat, paddle- board, and water cycle rentals. For a listing of stores and merchants that serve visitors in the Crestline/Lake Gregory area, click here. There is also much more than stores to be found here--on the Memorial Day and Labor Day weekends, visitors flock to Crestline for our tradition of holding yard sales during these holiday weekends. Come up and spend the weekend, and you'll find treasures on nearly every street. 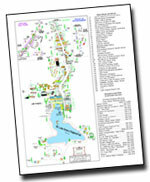 To download a PDF copy of the Crestline Business Map, click on the map.